Reports had it that the naval officer killed his lover and took to his heels until recently when a discreet investigation conducted on the incident by DCP Abba Kyari-led Inspector-General of Police Intelligence Response Team unraveled the mystery behind the crime. Saturday Punch learned the investigation followed a report made by the father of the late naval officer to the police. A police officer told Punch that Jaja confessed to the crime and led investigators to recover the carcass of the naval officer in the bush as well as the deceased’s Hyundai Veloster which he sold for N1.9m. While giving a shocking revelation about the crime in an interview with a Punch correspondent on Wednesday, 28-year-old Jaja narrated how he struck a relationship with his late boss and lived with him in his one bedroomed apartment. Jaja explained that he helped the late officer to execute two contracts worth N22.8m in September 2017 and he promised to give him a share of N2.5m. He said for ethical reasons, Yusuf did not use his name to secure the contracts, which involved the supply of computers to technical schools. 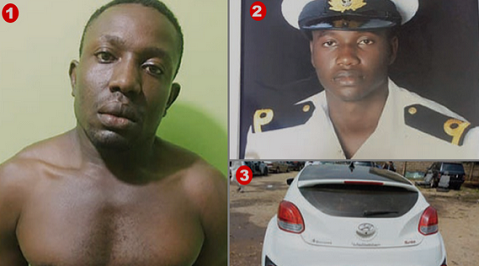 He told Saturday Punch that he began to plan Yusuf’s murder in April 2018 when the naval officer returned from Abuja with a new Hyundai Veloster. Jaja stated that he met with the deceased on April 30 and demanded to know why he refused to pay him. Ajaja explained, “He said he did not send me to marry and that I should carry my cross. I went back to him the next day for the money. He asked me to help him prepare noodles. There was a drug, Tanlin, in my pocket. I bought it because of a dog that my neighbor, who just packed out, left behind. The dog was disturbing me and I wanted to give it the drug so that it would sleep off. I put a little of the drug in the noodles. I discovered the drug did not have any effect on him. The self-confessed murderer said his boss did not suspect something was amiss when he returned from work in the evening, adding that the officer retired to bed afterward. He said he unleashed terror on the boss around 4am while he was still asleep in the bedroom, stabbing him to death with a knife. “I packed his corpse in a bag and kept it in the boot of his car parked on the premises. I cleaned the bloodstains on the floor, wore his uniform and drove the car out of the barracks. I drove the car to a village called Apani and dropped his body in a bush. I looked for a tire and set his corpse ablaze. I burnt it so that nobody would be able to trace him. “Still in the uniform, I drove the car to Benin, Edo State, where I sold it to one Alhaji. He did not want to buy the vehicle because I could not give him the documents. I convinced him that I am a naval officer and that he has no reason to be afraid. He bought the car N1.9m, but he was to pay me a balance of N120,000 before I was arrested through a church member I exchanged my boss’ phone within Port Harcourt,” he narrated. The expectant father further revealed that prior to his arrest, he traveled to Lagos State to withdraw N250,000 in Yusuf’s bank account, adding that he sent a text message to Onye’s phone to implicate his boss and traveled back to Port Harcourt.